Greetings, nephalem! For those of you who are about to experience Seasons for the first time on PS4 or Xbox One, we’ve put together a handy guide to help you get started. Below are some of the things you might want to know, including answers to a few common questions. Seasons are a fresh way to experience the game as though you were playing it for the first time—complete with rapid character leveling and gear upgrades. While a Season is active, players can create characters that are separate from their current non-Seasonal characters. Your first character in a Season will start completely from scratch. Each additional Seasonal character can only share progress with this character. When the Season ends, these characters will become non-Seasonal and any items, progress, or Challenges they’ve earned in the Season will be available to non-Seasonal characters. 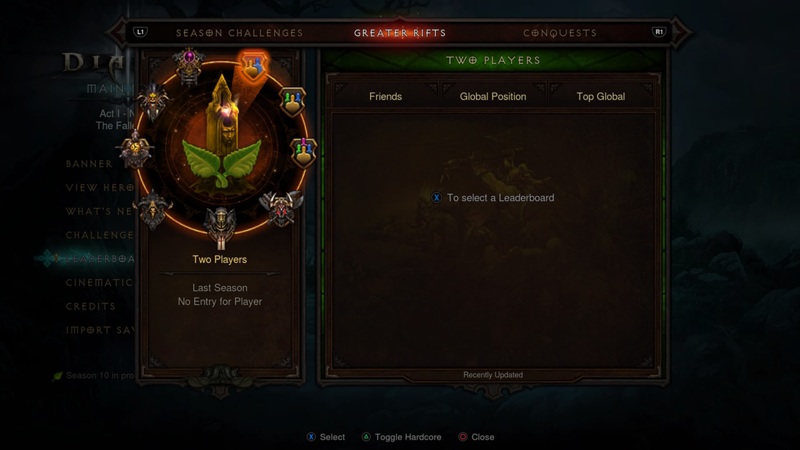 If you’ve been itching to take a friend through the game for the first time, or simply want to experience the joy of playing the game with a clean slate, Seasons are the perfect way to do so. 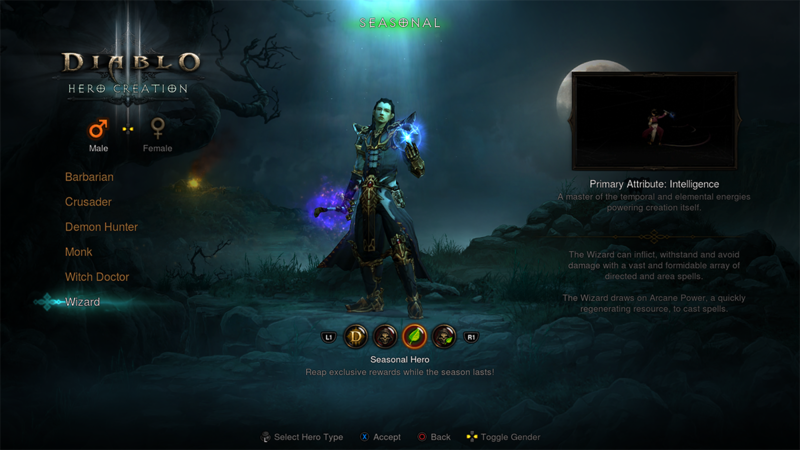 To make a Seasonal character, first make sure that you’re logged in to either the PlayStation Network or Xbox Live, then choose the Seasonal Hero option on the character creation screen, which is available whenever a Season is active. After that, follow the usual character creation process—that’s it! If you’d rather not create a new character to play in a Season, you can “Rebirth” an existing one. To do this, select an existing non-Seasonal character from the main menu and choose the Rebirth option. This will revert the character to level 1 and make them Seasonal. Their previous gear, Paragon points, Challenges, Kanai’s Cube powers and so on will be unavailable to them until the Season ends. The Season Journey is a unique series of challenges available only to Seasonal characters. 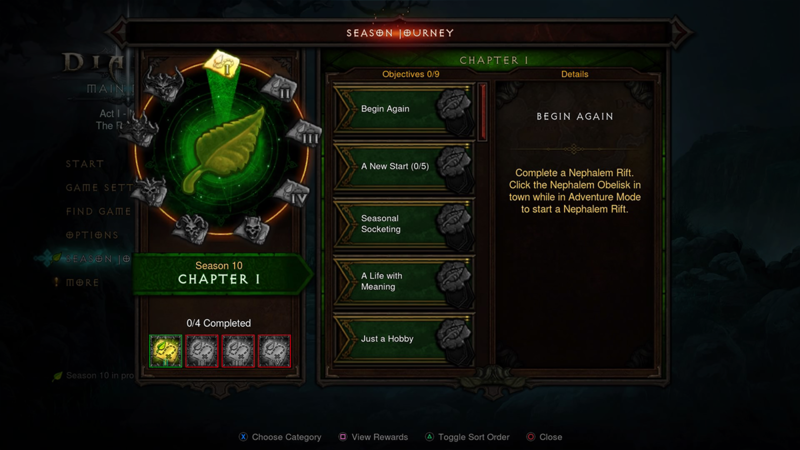 By completing chapters in the Season Journey, you can unlock exclusive Season-only cosmetic rewards. You can view your progress in the Season Journey at any time on your Seasonal characters by pressing left on the D-pad in the game, or on the main screen through the menu. Speaking of rewards, working your way through the Season Journey has another nice perk! 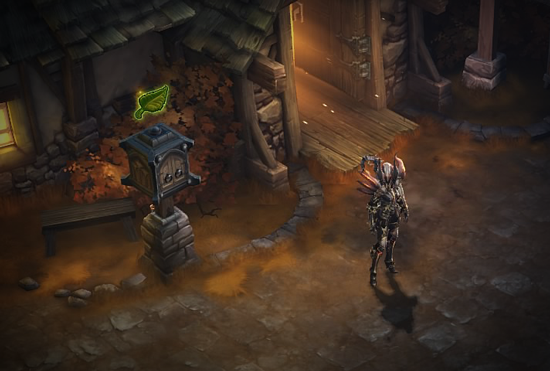 Completing Chapters 2, 3, and 4 of the Season Journey will reward you with three Haedrig’s Gifts. 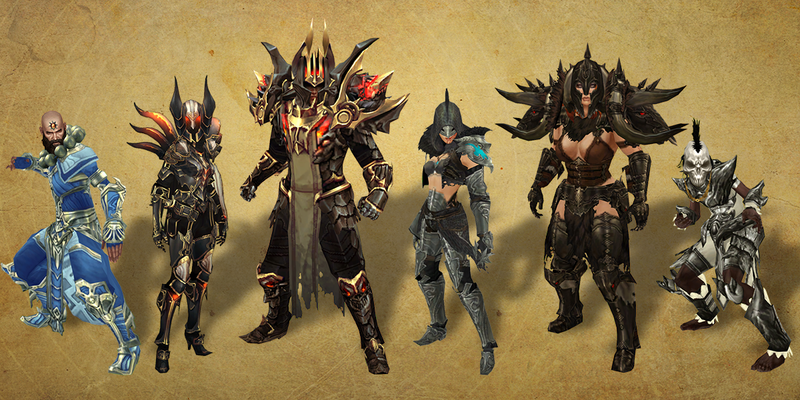 Each one contains a few pieces from one of your class sets. In Seasons, we've taken the concept of Challenges to the next level by introducing Conquests—difficult tasks that can only be completed by a Seasonal hero. Completing Conquests is an important part of the highest tiers of the Season Journey, and earns you points toward your Seasonal Challenge point total. 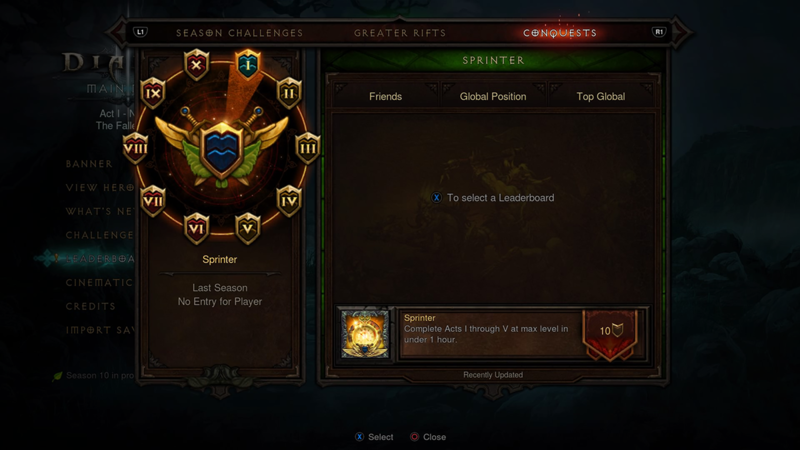 As you complete Conquests, reach new heights in Greater Rifts, and increase your total Challenge points, you may land yourself a spot on the Seasonal Leaderboards. These allow you to see how your progress in different areas compares to your friends and other players worldwide. 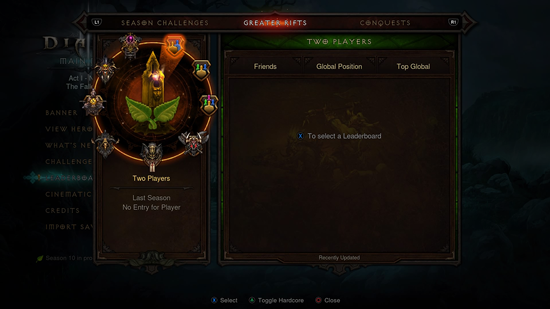 You can access the Leaderboards through the menu, either in-game or on the main screen. You might be asking yourself what happens to all the amazing rewards you’ve earned at the end of the Season. The short answer is: You keep them! 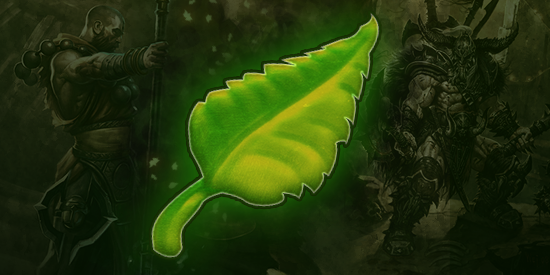 All items and Challenges you’ve earned, experience you’ve gained, Kanai’s Cube powers you’ve unlocked, crafting recipes you’ve discovered, and so on will roll over to your non-Seasonal characters as soon as the Season ends. Once that happens, you’ll have 30 days to collect any items you’ve earned during the Season through the mailbox available in any town hub on your non-Seasonal characters. Q: When does the first console Season start? A: The upcoming Season is scheduled to begin Friday, March 31 at 5 PM PDT on console. Q: Will the upcoming Season be the same for console and PC/Mac players? A: Yes. Seasons on console will start with Season 10 to create parity between console and PC / Mac players going forward. Q: What will happen to Challenges that I complete during the Season? A: Any Challenges you complete during a Season will automatically be completed for your non-Seasonal characters as well. The only exceptions are Conquests and Season-exclusive Challenges—since these are not available to non-Seasonal heroes, they won’t be available after the Season ends. That wraps up all the info you might want to know before playing Seasons. Are you looking forward to discovering the Season Journey? 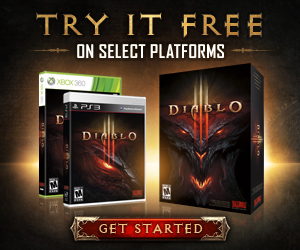 Ready to once again experience a fresh start in Sanctuary? Let us know in the comments, and we’ll see you soon, nephalem!